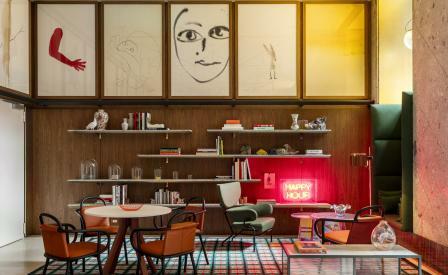 The global trend for affordable design accommodation continues apace, finally making a presence in Milan, thanks to the canny collaboration between Spanish architect and designer Patricia Urquiola and budget friendly hotel group Room Mate. Located smack in the city centre, a quick two-minute stride from the Piazza del Duomo, the 85-room Giulia is saturated in optimistic colour, with just a whiff of Milan’s famous mid-century mood. ‘It’s new, fresh, fun and welcoming,’ Urquiola states of the cheerful interiors. The prices might be economic, but the finishings are top-rate, with most of the furnishings designed by Urquiola and custom-made by Cassina, where she has recently been appointed creative director. In the guest rooms, bold armchairs by design brands Kartell and Moroso sit alongside lamps by lighting companies Flos and Oluce, while grid patterned Kvadrat curtains add visual texture. Downstairs, an eclectic mishmash of furnishings and colour combinations make up the lobby space, which is also lined with artwork commissioned by local creatives. The third property in Italy, following two openings in Florence, this is a busy time for Room Mate Hotels, who along with a Malaga launch, also this month, continues its international expansion at a dizzying rate.